The CData JDBC Driver for QuickBooks integrates QuickBooks data with wizards and analytics in IDEs like Aqua Data Studio. This article shows how to connect to QuickBooks data through the connection manager and execute queries. The following procedure can be followed with any of the CData JDBC drivers. To connect to desktop editions of QuickBooks, use the Remote Connector application included with the installation. The Remote Connector is a lightweight, stand-alone server that enables you to connect to remote QuickBooks instances. It is also used to connect your application to QuickBooks in situations where direct COM access to QuickBooks is not available (e.g., ASP.NET, Java, or a company file on a remote machine). For more information and a step-by-step guide to establish a connection, refer to the "Getting Started" guide in the help documentation. 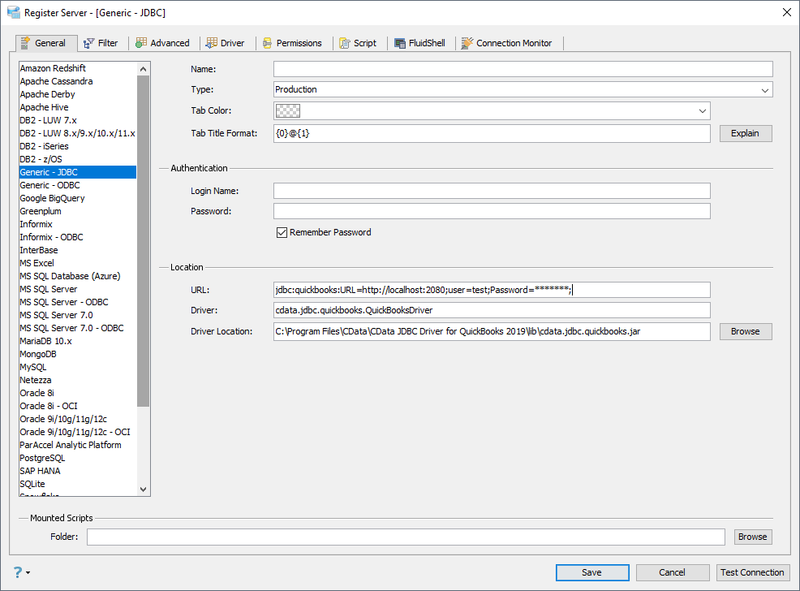 After you have successfully connected to QuickBooks from the Remote Connector application, you can use the connection manager to define connection properties and save them in a new JDBC data source. The company file can then be accessed from Aqua Data Studio tools. In Aqua Data Studio, select Register Server from the Servers menu. In the Register Server form, select the 'Generic - JDBC' connection. Name: Enter a name for the data source; for example, QuickBooks. Driver: Enter the Driver's class name, cdata.jdbc.quickbooks.QuickBooksDriver. Driver Location: Click the Browse button and select the cdata.jdbc.quickbooks.jar file, located in the lib subfolder of the installation directory. You can now query the tables exposed.